The largest field ever assembled for a round of the Benchmark Homes Elite Cycling Series is also potentially one of the strongest in the history of the series. Round two, the Bluespur Classic, is being held on the South Island’s West Coast near Hokitika and features Olympic medallist Mark Ryan, all three first round category winners, elite winner Cameron Karwowski from Southland’s H&J’s Outdoor World Avanti Plus Team, master Scott Wilder (Dad’s Army) and Elyse Fraser (Benchmark Homes Team) who won the women’s event. 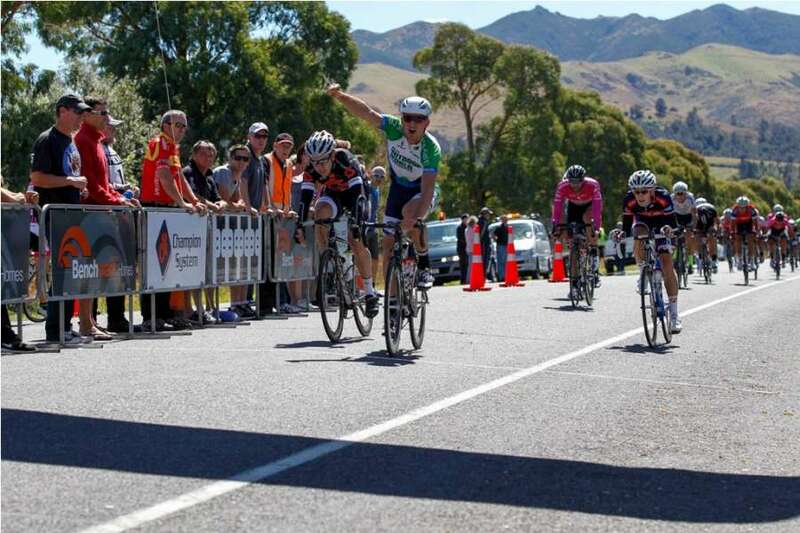 Sam Horgan, who is fresh from a tough campaign in Australia riding for his UCI Continental team Budget Forklifts, won this round’s elite race last year which set him up for the overall elite series title. Horgan is part of a strong Scotty Browns Racing team that includes Ryan, his Budget Forklifts team mate Michael Vink and recent Coffee Culture Le Race winner impressive 16 year old Keagan Girdlestone. Horgan said he was looking forward to the race this weekend, saying it was a challenging course that favours aggressive racing. “Hopefully it will be a good, hard race and the strongest riders will shine,” he said. Horgan was expecting strong challenges from his Budget Forklifts team mate Dan Barry, who is riding for Tasman Wheelers on Sunday, Jason Christie (Breads of Europe All About Plumbing) and the strong looking L&M Group Ricoh and H&J’s Outdoor World Avanti Plus teams. Backing up after Le Race Girdlestone confirmed his good form finishing third in the second round of Australia’s National Road Series, the Tour of Adelaide, which finished on Sunday, a tour won by Horgan’s Budget Forklifts team mate Brodie Talbot. Ben Robertson (Benchmark Homes), Christie (Breads of Europe All About Plumbing) and Tasman Wheeler’s Barry, Kieran Hambrook, and former double Olympian Chris Nicholson. Under 23 Series leader Brad Evans (Team Calder Stewart Road) will have his work cut out defending his leaders jersey from Girdlestone, H&J's Outdoor World’s Matthew Zenovich and Joshua Haggerty, Daniel Whitehouse (Scotty Browns Racing), Benchmark Home’s Ben Johnstone, who won the Canterbury Championships Under 19 road racing title last Sunday, Grayson Napier (L&M Group Ricoh) and Modus – Homestyle’s Mitchell Podmore and Adam Bull. Scott Wilder (Dad's Army), who leads the masters 35 to 44 classification, had a confidence boasting win in the Canterbury Championships Masters 1 race on Sunday against many of the riders keen to take his leaders jersey from him, including Glenn Rewi (Armstrong Subaru), Michael Sleeman (Velocity) and Wayne Smythe (Sport Canterbury Racing). Armstrong Subaru’s Glenn Gould and Reon Park, Ian Smallman and Scott McDonnell from Team Thule, Warrick Spence (Tasman Wheelers) and Justin Sims (Armitage Williams) loom as other threats for Wilder. Dunedin’s Paul Gough (Cycle World) will face competition for his 45 to 49 classification leader’s jersey from Warmup Cycling’s Lee Johnstone, Team Thule’s Neil Sutherland and Blair Stuthridge and High 5 CFO’s Steve Scott. Gough’s Cycle World team mate Ray Dunstan leads to over 50 master’s classification that should feature his team mate Tony Catterick, Phil Scott (Dad’s Army), Thule Black’s Phil Chester, Andre Chappell and Graeme Nuttridge, Ron Pithie (Velocity), Jorg Engelbrecht (Team Thule Cycling), David Roche (Warmup) and Barry Tinkler (Kiwi Style Bike Tours). Nuttridge recently qualified to represent New Zealand for the second time at the UCI Amateur Road World Championships (former UCI Masters Road World Championships), in Slovenia in August this year, finishing in the top twenty five percent of his age group at a UCI World Cycling Tour (UWCT) sanctioned masters event in Perth last month. Professional Reta Trotman heads the largest women’s field ever for a round of the series. Trotman, who recently won Le Race in record time, will be very keen to go one place better than her second in the opening race of the series which saw Fraser escape to claim a solo win. Fraser has a strong Benchmark team that includes triathlete Julia Grant, Sharlotte Lucas and Marewa Sutherland. The experienced Tracy Clark leads Vidasana Thule team that features Christchurch riders Jeannie Blakemore, Jeanette Gerrie, Tessa Jenkins and Lucy Timmings. New Zealand junior representative Maddi Campbell should make her presence felt riding for H&J's Outdoor World Avanti Plus and Georgia Catterick (Cycle World Fairweathers) will be keen to hold off Jenkins and Timmings as well as Georgia Vessey (H&J's Outdoor World Avanti Plus) to retain the Under 19 classification leaders jersey.